The American Civil War began in South Carolina on April 12, 1861, when Confederate batteries in Charleston Harbor opened fire on Fort Sumter; the first shots fired in a war that would claim over 600,000 American lives. The State of Connecticut did not falter in its support of the federal government. Over 55,000 young men from Connecticut served in uniform during the war. Connecticut industry supplied the armed forces with firearms from the Colt Firearms Company and many independent contractors produced a plethora of weapons. Approximately 10% of the Connecticut men who served in the war died while in service, over 2,000 of them in battle. Almost 700 Connecticut soldiers died in Confederate prisons. The women of Connecticut stood by their men at war by creating Soldiers Aid Societies. The Hartford Ladies Aid Society was one of the largest in the nation during the war. The men serving from Connecticut were present at nearly every major engagement of the war from the First Battle of Bull Run to Appomattox. 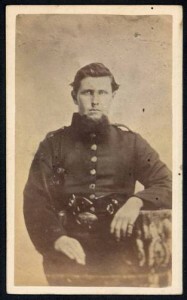 Connecticut regiments fought with distinction at Antietam, Drewry’s Bluff, and Cold Harbor. As with the nation itself, Connecticut’s bloodiest day came on September 17, 1862, at Antietam, Maryland. 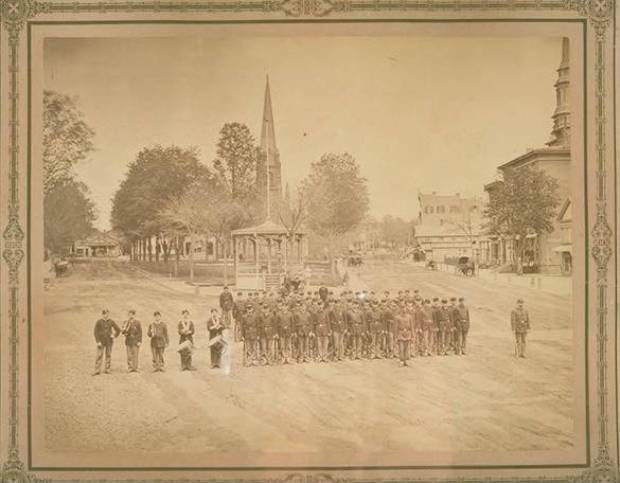 The sacrifices of Connecticut men and women can be witnessed firsthand in the collections of the Connecticut Historical Society. View the diary of Sergeant Samuel Grosvenor of the 16th Connecticut Regiment and learn of his trials and suffering during a 7-month imprisonment at Andersonville. Read the words of Major Edward Blake’s family, who were in search of their lost son after his disappearance in battle in Virginia. Witness the affection, hope, and dreams for the future of couples like Frederick Lucas and Jennie Wadhams, or John Best Cuzner and Ellen “Nell” Sperry. These and countless other stories are found in documents in the library of the Connecticut Historical Society. “Catalog Record of the Edward Blake Papers, 1861-1862.” Connecticut Historical Society Library Catalog, 2013. Link. “Catalog Record of the Fred Lucas and Sarah Jane Wadhams Correspondence, 1863-1867.” Connecticut Historical Society Library Catalog, 2013. Link. “Catalog Record of the John Cuzner Collection, 1837-1933.” Connecticut Historical Society Library Catalog, 2013. Link. “Catalog Record of the Samuel Grosvenor Diary, 1864.” Connecticut Historical Society Library Catalog, 2013. Link.